On 10 November, 2015, the Centre welcomed Alex Woolf (St Andrews) to discuss ‘Ecclesia Scoticana: The Irish and Scottish Church in the tenth to twelfth centuries’. Below is this listener’s brief summary of the lecture. Alex began by explaining that this seminar was based on his speculations concerning the status of the Scottish Church from the 10th through the 12th centuries. 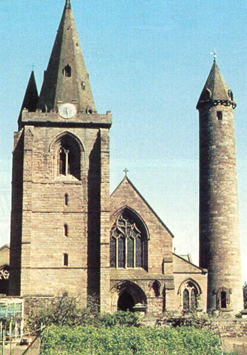 The Scottish Church at this time was very small and yet still managed to function with only two or three bishops. He explained that documents dating after 1151 attest to a sudden expansion of the number of Scottish bishops. He believed that these two main factors indicate that the Scottish Church did not function as a separate entity during this time, but that it was an integrated part of the Gaelic Church. Alex’s basic argument was that we, as researchers, have been presumptuous in assuming that the Scottish church functioned as a separate entity. The threat of being absorbed into the English church in the 12th century is often seen as the Scottish church desiring to remain independent of the English church. Alex suggested that this was not the case, but that the 12th century crisis was to decide whether the Scottish church should be a part of the Irish church or the English church. He argued that this concept of an independent Scottish church was likely influenced by the current political climate. He suggested that there is evidence for a Gaelic church in several documentary sources. Often sources indicate that Scottish clerics received their training in Ireland, especially in Armagh, the chief educational centre at the time. Occasionally, holy men of Alba will be mentioned as serving in Irish churches or monasteries. In 1064, the death of the chief teacher at Armagh mentions that his birthplace was in Scotland. These sources indicate that there were many interconnections between places and people in both Ireland and Scotland. Alex suggested that it is far more likely that these references suggest a structurally unified Gaelic church. Synods held in Ireland also seem to coincide with structural changes in Scotland. The sudden expansion of the number of Scottish bishops appears to be directly related to the Synod of Kells-Mellifont in 1152. Unfortunately, many of the records of the synods did not survive, and many of the sources we do have are from the perspective of Armagh, as the annals in Scotland from the 8th century until the end of the 11th century are missing. Alex indicated that the Scottish church did break away from the Irish church towards the end of the 12th century. He suggested that this was likely in part due to the Norman invasion of Ireland. Our seminar series continues on 17 November 2015 with Miles Kerr-Peterson (Glasgow) discussing ‘Reformation, bloodfeud and east coast shipping: the Earls Marischal 1542-1623’. This will be held in Room 202, 3 University Gardens at 5.30 pm.